It's durable, it's dependable and, plainly said, you won't find a more rugged, high-performance scope that offers more features and such a large field-of-view at a comparable price. The outstanding fully multi-coated optics provide an impressive 91% light transmission, giving you a scope that's not only tough, but packs the performance you expect from Bushnell.® Featuring a very wide field-of-view and extra long 3.5" eye relief for instant target acquisition you can be confident that your scope won't fail you at that key moment.  Wide-angle field-of-view  Fully multi-coated optics  Rugged shockproof construction  100% waterproof/fogproof construction  Dry-nitrogen filled  1/4 M.O.A. fingertip, audible / resettable windage and elevation adjustment  3 1/2" eye relief  91% total light transmission  Fast-focus eyepiece  Adjustable Objective Lens. 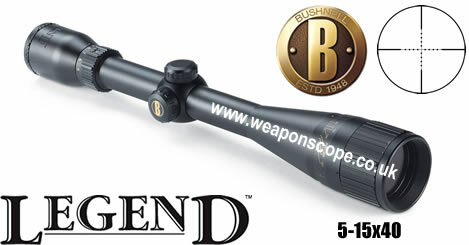 This scope has a RRP in the UK of £299.95 so this has to be a real bargain!